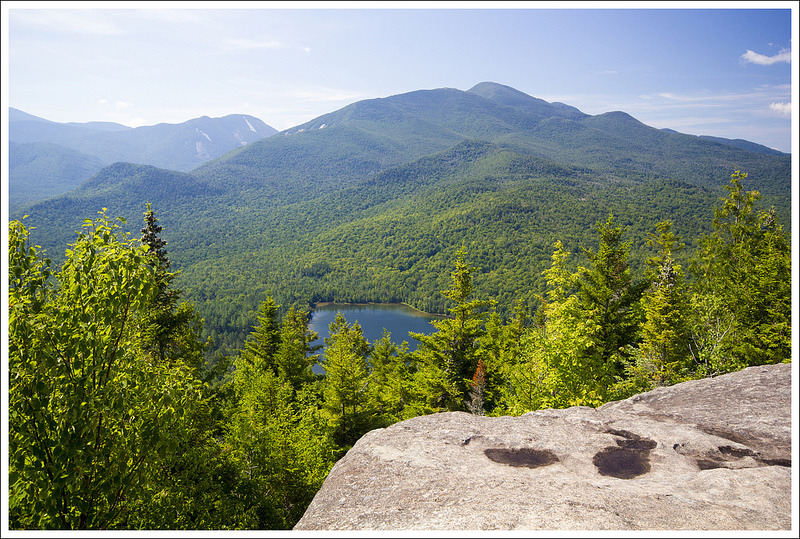 This delightful 2.4 mile hike offers fantastic views of Heart Lake and the High Peaks! With under 600 ft of elevation gain and a largely uncomplicated trail, this hike is perfectly suited for novices and young families. 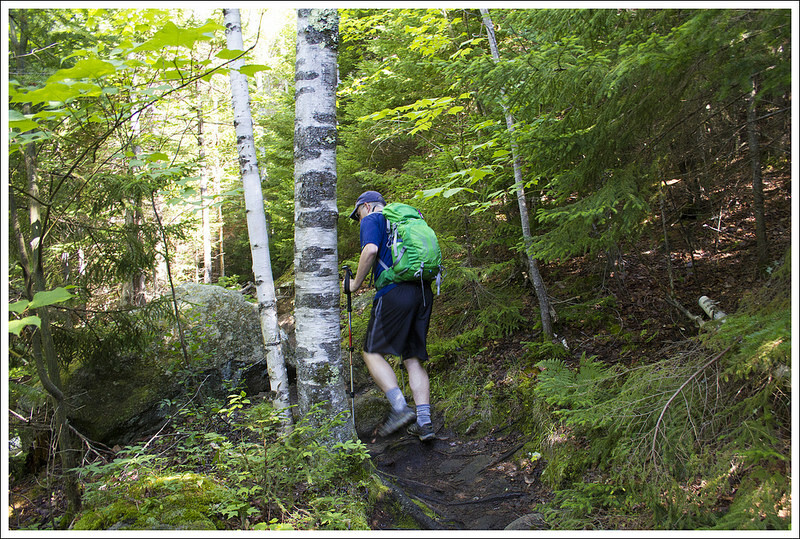 It’s certainly one of the area’s ‘do not miss’ hikes! The summit of Mount Jo offers great views of the High Peaks and Heart Lake. 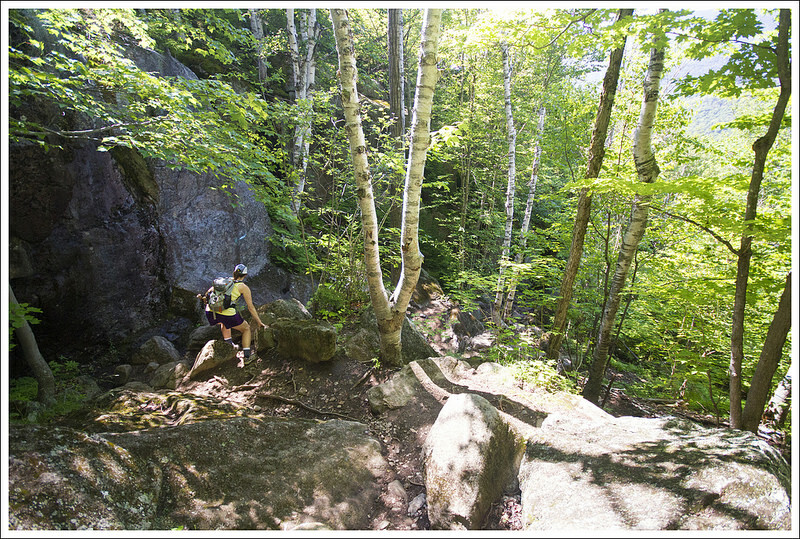 After a strenuous day on Giant Mountain, we wanted to keep hiking – but we wanted something sort of laid back for our third day in the Adirondacks. We settled on Mount Jo – a relatively small peak (2,976′) rising above the shores of Heart Lake. We had read in multiple guides that Mount Jo offered the scenery of a 4,000 footer with only a fraction of the physical effort. That sounded perfect for our easy day! 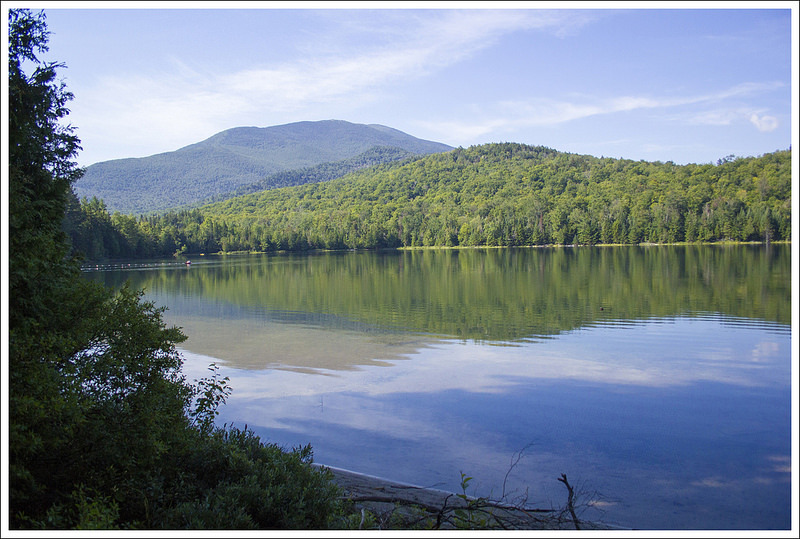 Our hike began at the Heart Lake Program Center, which is the main hub for the Adirondack Mountain Club. The 700-acre property is home to the Adirondak Loj guest house, lots of rustic camping options, and the High Peaks Information Center. 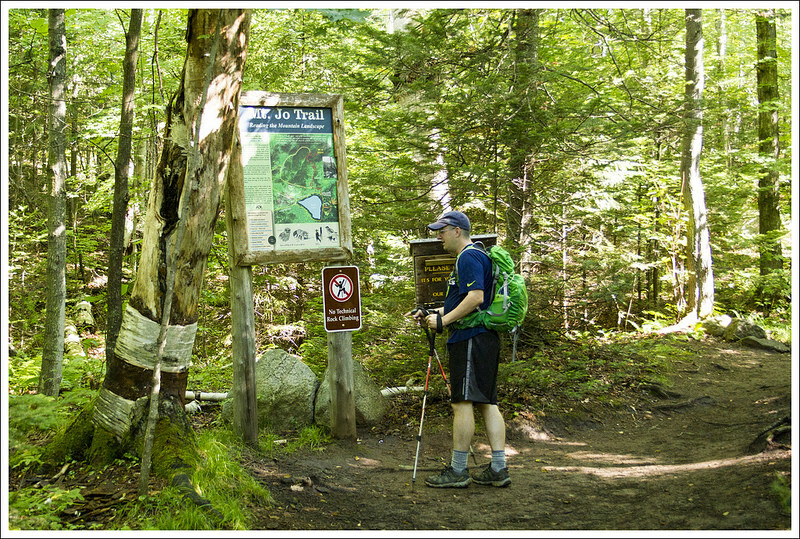 Many of the area’s most popular trailheads are located in the vicinity. At press time, trailhead parking at Heart Lake was $10.00 a day for non-members (ADK member parking was $5 and all prices went down by half for parking arrivals after noon.) When we visited, the 200-car lot was nearly full by 10 a.m. We recommend arriving early if you want to set out on any trail from this popular spot. Beautiful Heart Lake. 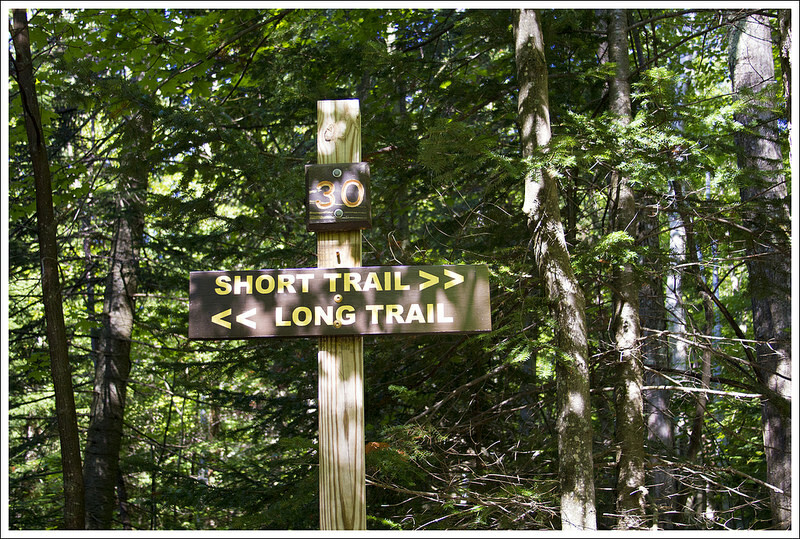 Below: The information board and trail register; Short Trail or Long Trail? 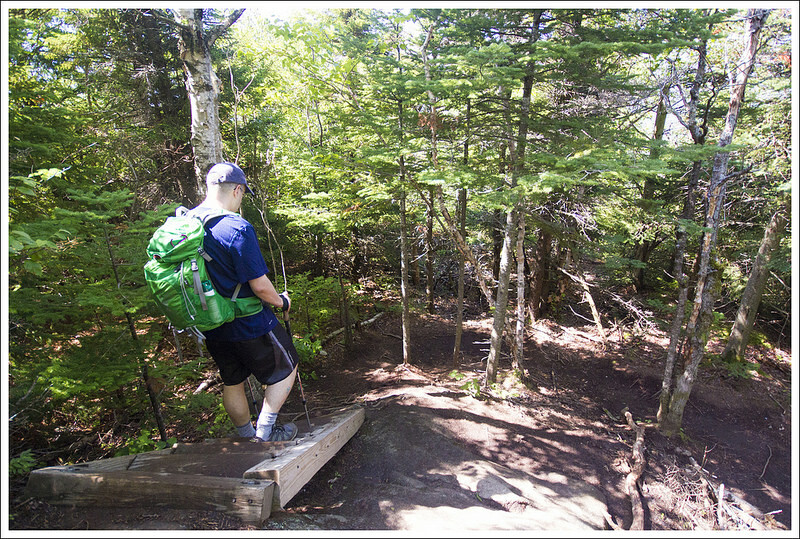 ; Adam makes his way up the Long Trail. The trailhead for Mount Jo is located across from the entrance station at the end of the snowplow turnaround The hike started off along a wide path with flat, easy footing. We passed the Heart Lake Nature Museum and an open view of the beautiful lake. At trailpost #29 (all the junctions on the property are numbered! ), turn right onto the Mount Jo trail. Shortly after the turn, there is an information board and a trail register. 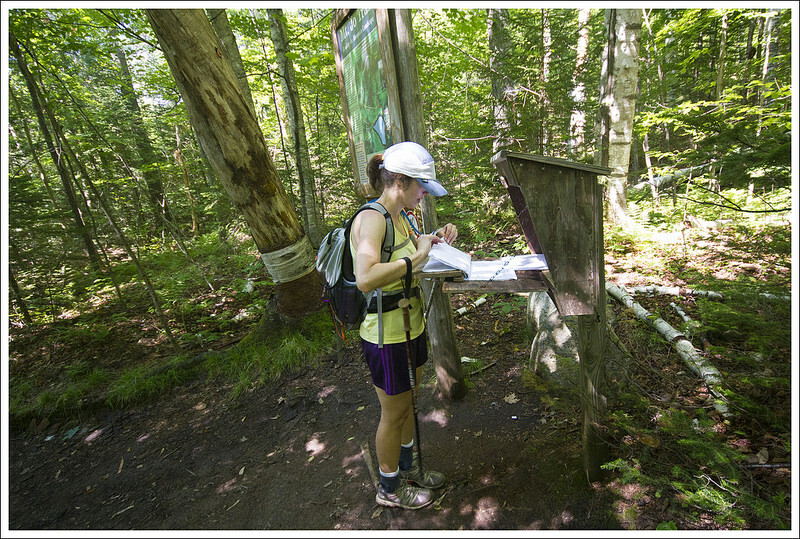 Most trailheads in the Adirondacks have a register for hikers to sign in, leave route details, and then sign out at the conclusion of their hike. 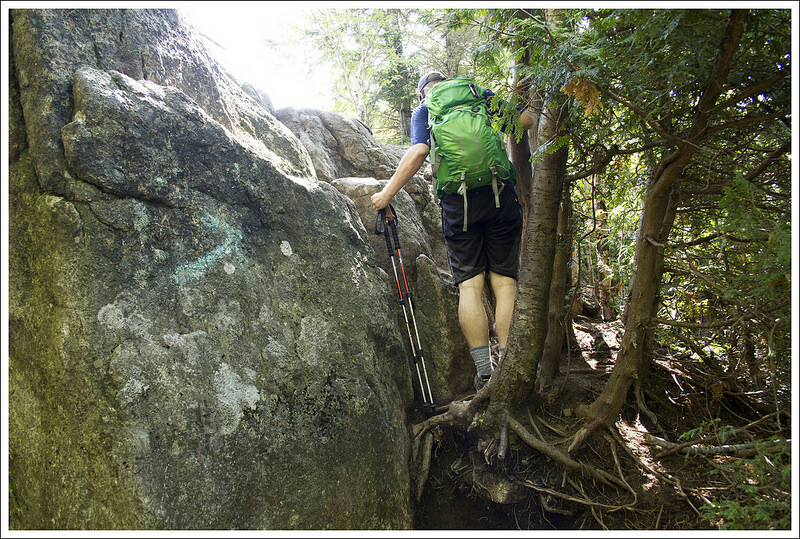 It’s an imperfect system, but definitely helps keep hikers safe in a large and rugged area. About a quarter mile after the register, the trail branches in two directions – ‘short trail’ and ‘long trail’. Adam and I decided to take the long trail up and the short trail down, allowing us to see unique scenery along a loop. 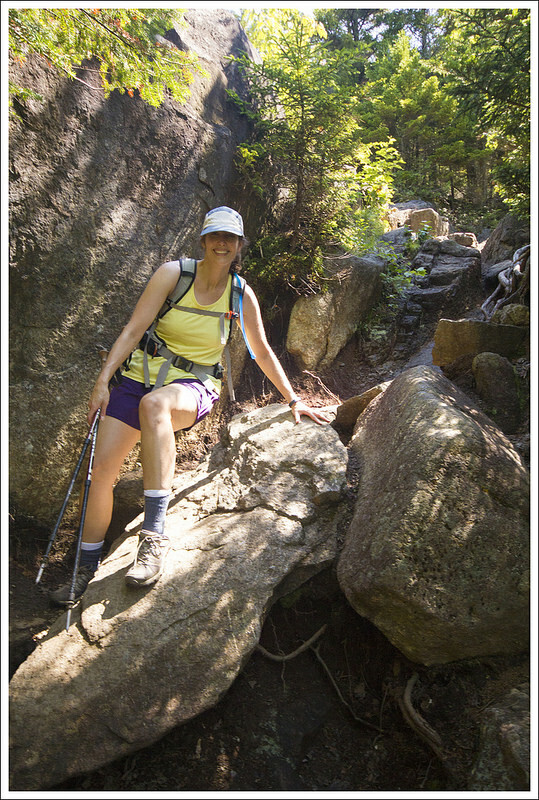 The long trail was beautiful – shaded by pine trees with footing composed of gnarled roots and rocks. 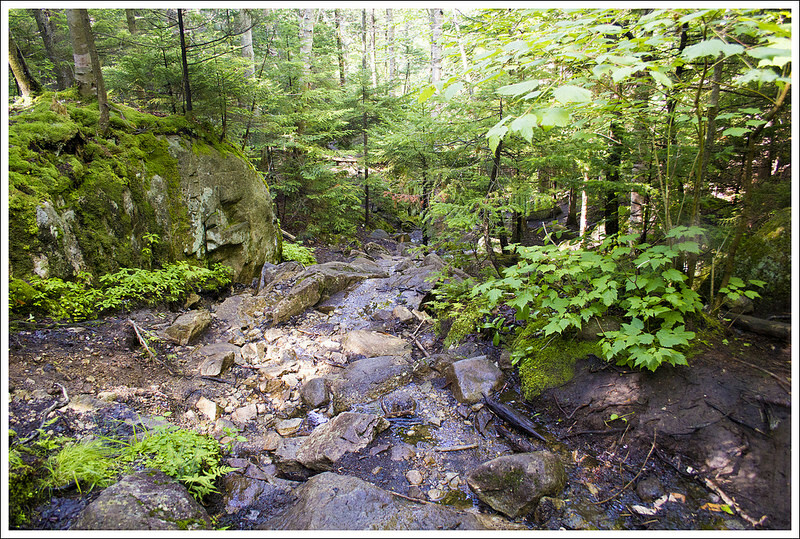 As we hiked, the trail became steeper and followed a stream bed. I imagine the stream bed is often dry in summer, but we hiked the morning after thunderstorms, so there was a trickle of water running. We met a chattering red squirrel along the route – they really are so much cuter than the gray squirrels we have in Virginia. At the top of the climb, the long and short trails met up again and joined routes to the summit. 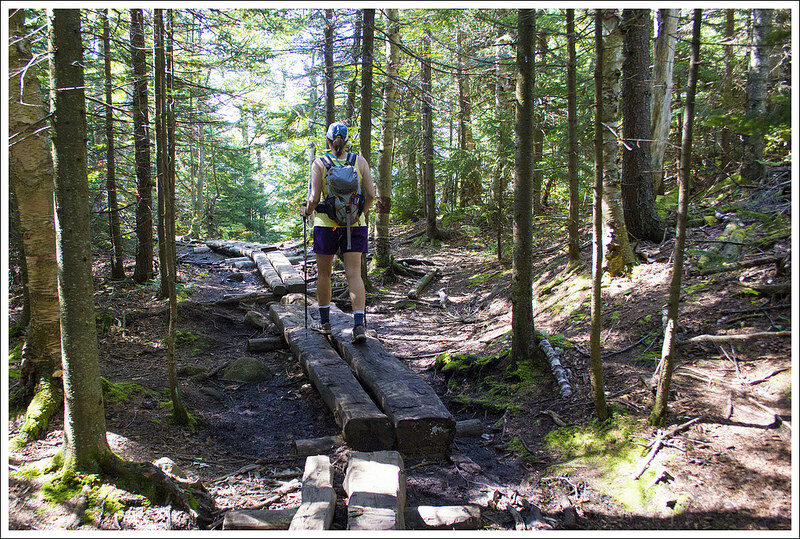 For a short distance, the trail was practically flat, passing over muddy areas on wooden planks. There was a non-intimidating ladder traversing a slab of granite, followed by a short but steep climb over boulders to the summit. At the top of Mount Jo, we had superb views of Heart Lake, Cascade Mountain, Mount Marcy, Algonquin Peak, Mount Colden, Indian Pass, and the Great Range. With the popularity of Mount Jo and the Heart Lake area, we were surprised to have the summit all to ourselves! We really enjoyed the view! 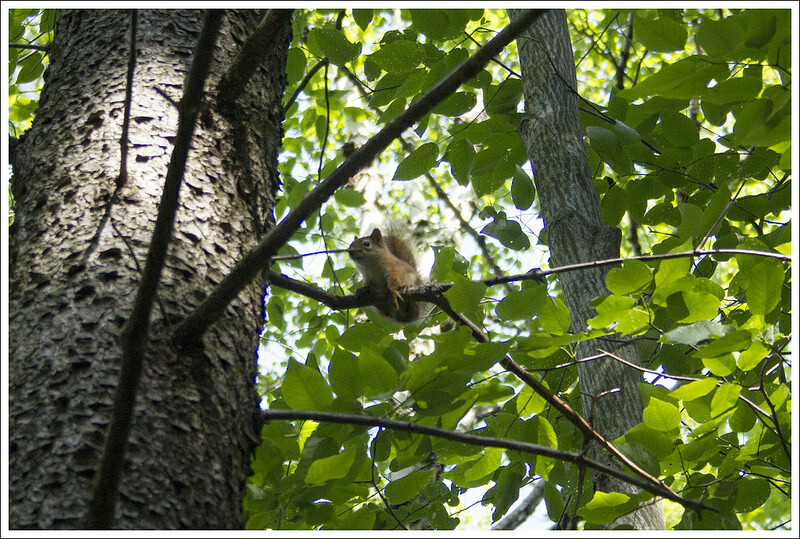 We spotted an adorable red squirrel. 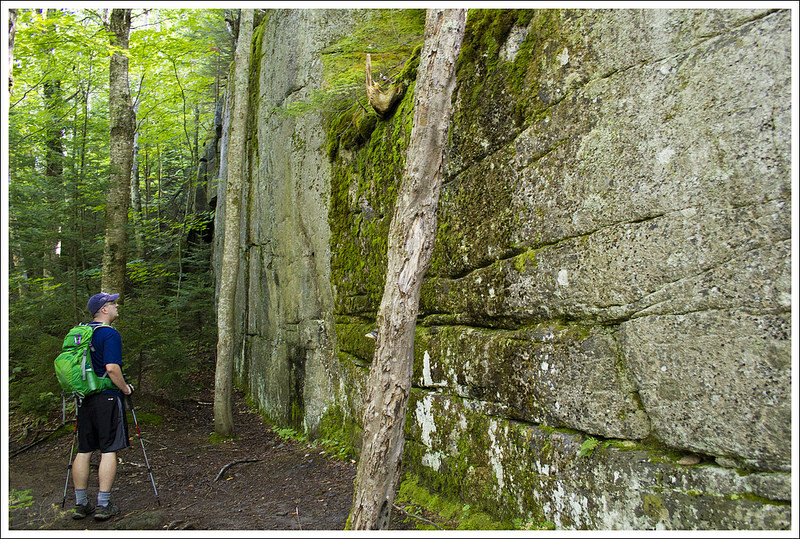 Below: Rock wall on the long trail up Mount Jo; At places the trail followed a stream bed; The trail became increasingly rocky and rooty. 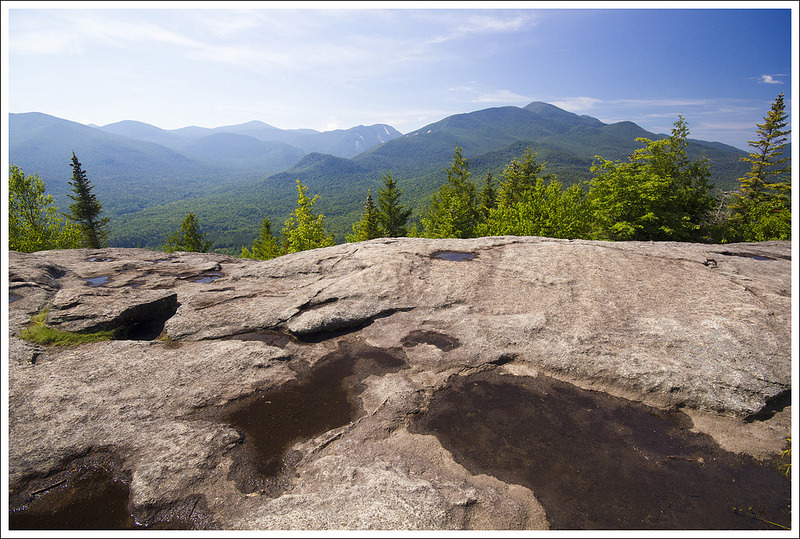 After a while, we were joined on the summit by a group of hikers led by one of the ADK’s summer naturalists. The club really offers a great variety of programs. We listened to the ranger describe and name the peaks and describe the geology of the area. I had no idea the Adirondacks had so many landslides and avalanches, but the scars she pointed out on the mountains made it very evident. 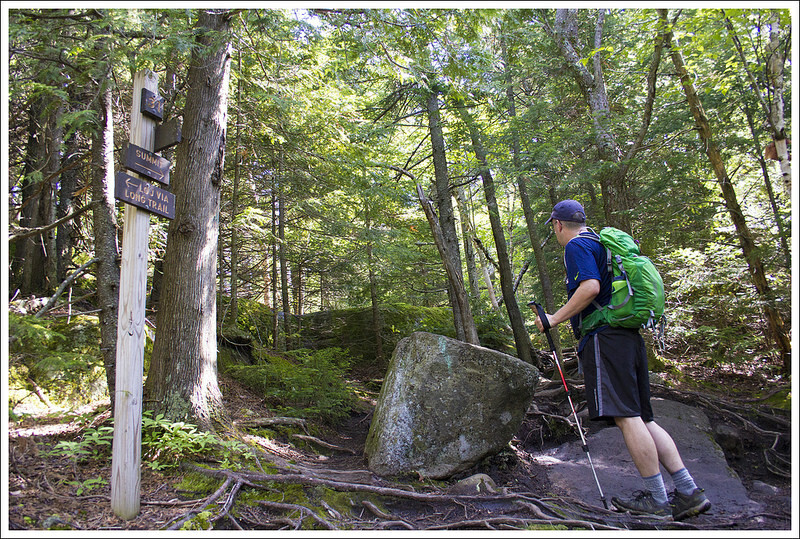 You can view the named peaks (and learn more about the area) in this interpretive trail guide/map created by the ADK. After a little more time at the top, crowds began to arrive and we decided it was time to make our way down the mountain. The short trail was a steeper route than the trail we had used to ascend. There were a lot more rocks to scramble over, but it was still mostly moderate terrain. We made sure we remembered to sign out in the register when we passed back by the trailhead. We also made a stop at the Nature Museum. They had neat, touchable displays demonstrating the flora and fauna present in the Adirondacks. Mount Jo was the perfect stop for a day of light hiking! Back at the High Peaks Information Center, we bought a couple cold drinks and made our way back to the car. It was early afternoon, so we decided it was time to get some lunch and check out the town of Lake Placid. Town turned out to be brutally hot – in the mid 90’s. All the shop keepers and restaurant employees talked about the unusual heat and how lots of people didn’t have air conditioning. I guess even when you head north for vacation, sometimes you still can’t escape southern-style heat like we have in Virginia! There was one tricky place to climb near the summit. 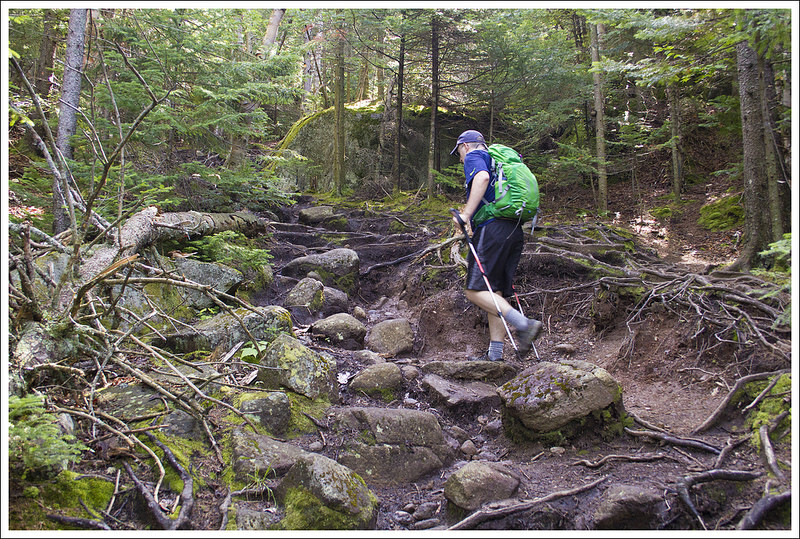 Below: The long and short trails rejoin near the summit; Wooden planks over muddy areas; Arriving on the summit. Mount Jo had a fantastic view. Below: Adam climbs down the ladder stairs; Christine descends the rocky short trail; There was a bit of scrambling necessary on the short trail descent. The trail starts across from the check-station and starts off with a flat footpath that winds through some thick, but beautiful forest. Bear right at the first junction towards Mt. Jo. You’ll pass by the Heart Lake Nature Museum and then reach the junction (trailpost #29) that leads up Mt. Jo. At .5 miles, you will reach another junction that gives you options to take the long path or the short path. The short path is much steeper, so we opted for the long path, taking the left path up to the summit. While the long path was easier, it was still fairly steep, having to climb up a rocky path. Luckily, this is a shorter hike so you can take your time if need be. At 1.1 miles, we reached the top of the junction with the short path and continued on towards the summit. The path levels out and it is just a quick .1 mile to reach the summit. Right before the summit there is a ladder and some other steep rocks to climb. The views at the summit were outstanding on this clear, but hazy day. The ledge was fairly wide and we could see part of Heart Lake below with mountains extending above. I spotted several cedar waxwings that were landing on the tops of all the spruces around us. Cedar waxwings have always been one of my favorite birds because of their unique facial markings and this was the largest grouping of them I have ever seen. The short trail was steeper and rockier than the long trail, but we still had lots of fun! Below: Christine signs us out in the trail register. We had everything to ourselves for a few minutes before others started arriving – one of the advantages for starting our hike early. On the way back down, we decided to take the short path at 1.35 miles to enjoy some different scenery. The short path was much more steep and rocky so I am glad we made the choice to hike down this section instead of up. We saw many more people coming up as we descended and some were struggling. We arrived at the bottom of the junction with the short trail at 1.75 miles, having descended over 500 feet in that short span. We bore left at the junction and made it back the way we came for the rest of the way. We arrived back at the start at 2.4 miles. When we got back to the parking lot, we stopped at the ranger station for some cold drinks. As I was waiting to check out, I overheard an older couple that were talking to the ranger about trying to hike up Mt. Marcy. We will cover Mt. Marcy in another post, but to put this into perspective it is the highest peak in New York and the most popular route takes at least 14.5 miles to hike it. It was probably around 1PM, they were wearing jeans, and only had one small liter of water with them. The man said he also had a bad back, but they really wanted to hike it. The ranger told them it was an incredibly bad idea and they didn’t have what they needed to prepare themselves for the hike. After a few minutes, the man came back inside and told the ranger they decided to do something easier (Mt. Jo) and the ranger told them that was a much better idea. I am sure we would have read the rescue story the next day in the news if they had proceeded. After the hike, we decided to drive into Lake Placid. Every American that lived in the 1980s remembers the Winter Olympics held here and the Miracle on Ice when the American hockey team beat the Russians to win gold. This town still holds the memories of the Olympics and this historic game alive through the stores and shopping – there was even a bakery named Miracle on Icing. 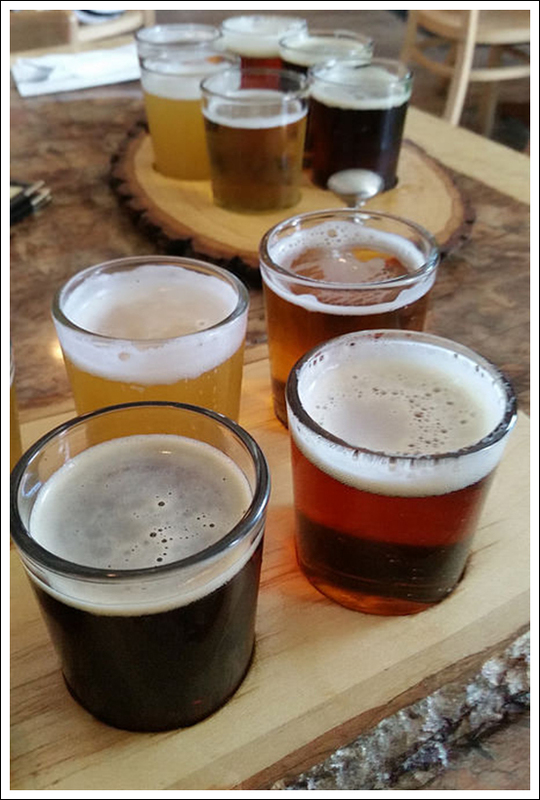 We made our way to Lake Placid Brewery and enjoyed a great lunch and sampled several beers from the brewery. We walked a little around the shops, but it was extremely hot that day so we decided to return back to the glorious AC in our cabin. If you are looking for a family hike with great views for minimal effort, look no further than Mt. Jo. 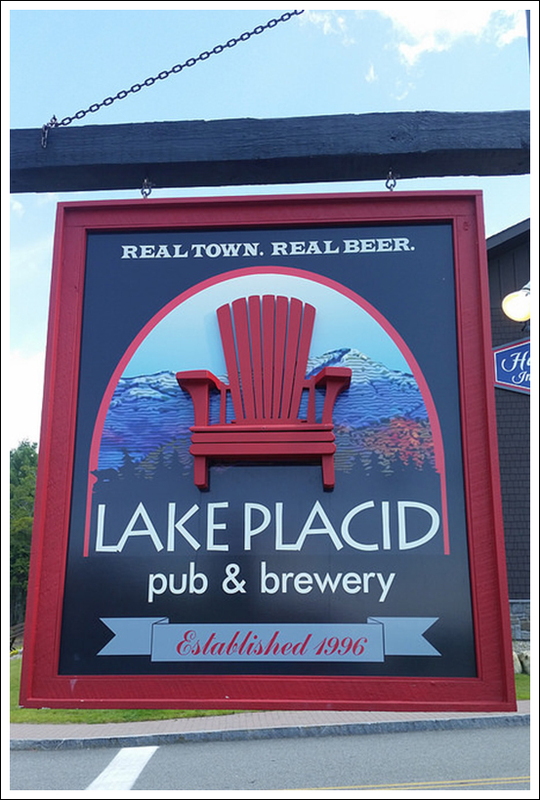 We had lunch at the Lake Placid Pub and Brewery. Good food and beer! Elevation Change – 555 ft. Difficulty – 2.5. 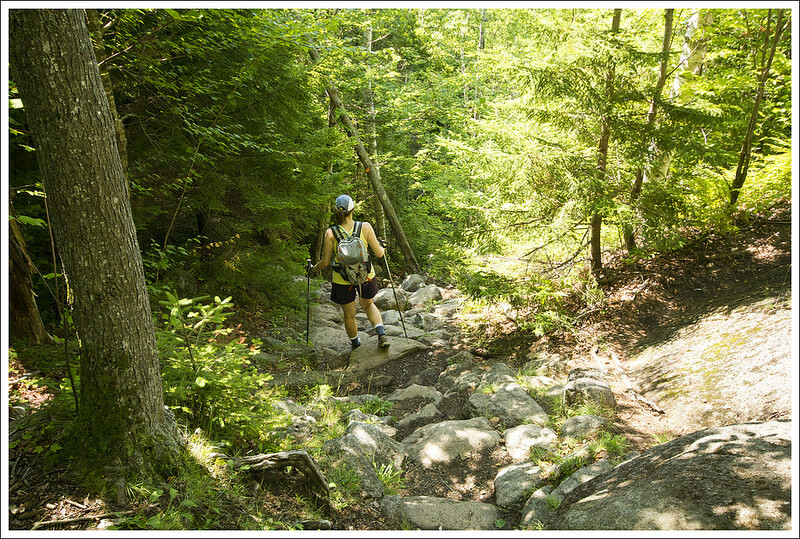 While the climb is steep in a few areas, the route is short and mostly easy to moderate. Trail Conditions – 4. The trail is well maintained and marked. It is still rocky and slippery in places, like most of the terrain in this area. Views – 5. You get fantastic payoffs for a relatively easy climb. Streams/Waterfalls – 1. There are a couple small trickles of a stream, but nothing noteworthy. Heart Lake, however, is beautiful! Wildlife – 3. The heavy foot traffic on this trail probably scares away most wildlife, but we did see a garter snake and a red squirrel. Ease to Navigate – 4. Trails are well marked and generally easy to follow. Solitude – 2. 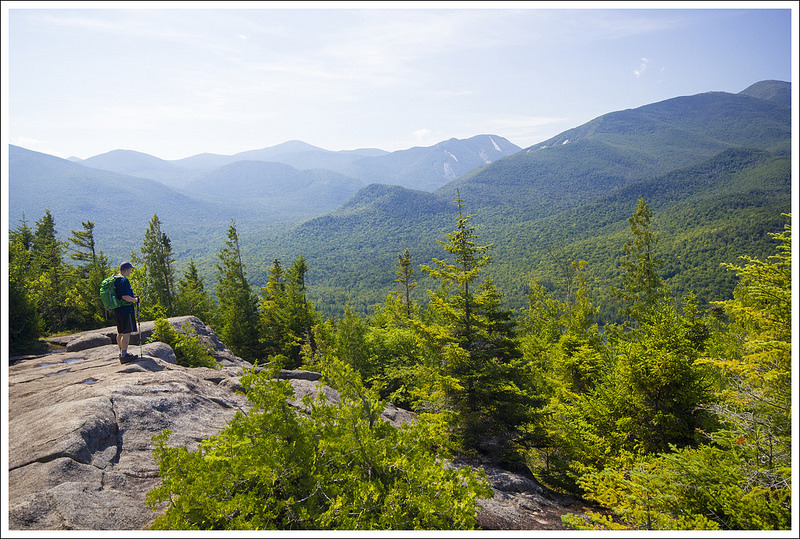 This is a popular and well-traveled hike. Great hike and post hike celebration. Good thing that couple talked with the ranger! Love the photos. Sad story about the star crossed lovers!